The genealogy research hours at the Baraga County Clerk are 8:30AM until 4:30PM, Monday through Friday. They provide access to birth, death, marriage, and other records, all listed from 1875 to the present. The County Clerk office is located on 16 North Third Street in L'Anse, MI. Up to three researchers are allowed at one time, and copies are $7 each for the initial copy, and $3 for any more. 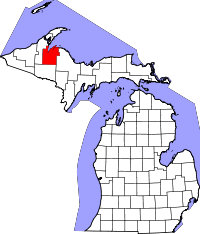 Baraga County is located in the top half of Michigan and borders Lake Superior. Parts of the Keweenaw National Historical Park, previously a large mining area due to the huge amounts of copper flowing from the lava flow there, and the Ottawa National Forest, a one million acre forest, are in the county. Due to the vast expanse of countryside and forests covering the area, the county population is small with less than 9000 residents.